The Village of Minier is conveniently located near major cities, highways, and interstates. 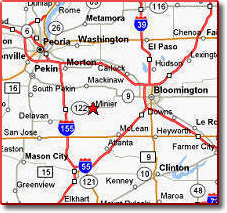 Minier is located approximately 30 miles from Peoria, 21 miles from Bloomington, 60 miles from Springfield, and 155 from Chicago and St. Louis. I-155 is located approximately 6 miles away and 22 miles from I-74. There are two major highways near Minier. IL-122 runs along the North side of Minier. Rt. 9 runs North of the village approximately 15 miles away. Below you will find an interactive map.